Louis Copeland's reputation for sleek tailoring and filling the gentleman's wardrobe is generations old, yet sometimes Irish men hit a bump in the road when the temperature rises - they still want to look stylish but, man, that heat! The answer? Natural fibres. 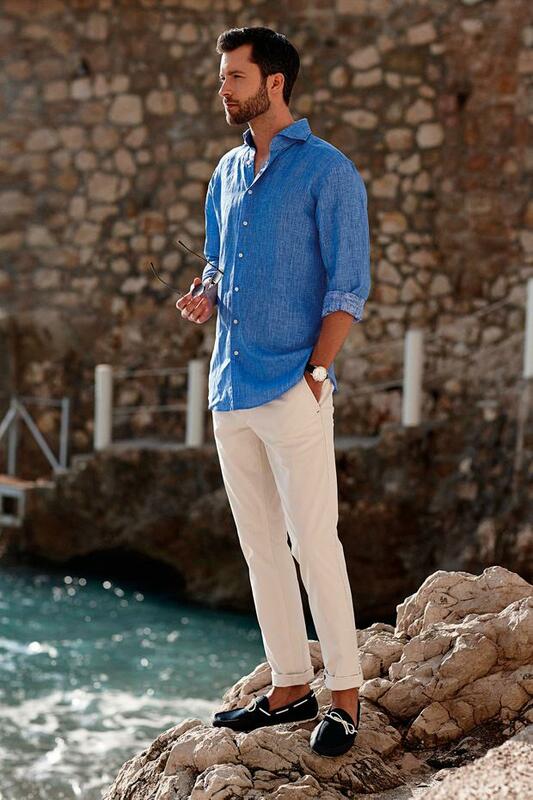 Linen shirts are cooling yet smart, worn with equally comfy 100pc shorts or trousers in mainstream and more pastel shades. Checking out Copeland's own brand blue linen suit with its eye-catching thick chalk pinstripe, I discovered the crease-resistant factor was achieved through judicious weaving. The 'warp' and 'weft' are two basic components used in weaving, and Louis opted for a lengthwise warp in linen which was held stationary on the loom while the transverse weft is wool, contributing to the crease-resistant qualities. For a woman who loves the challenge of packing a small case for a weekend away so I can be off the plane and out of the terminal in record time, my ears pricked up when I heard about Swims waterproof loafer-style deck shoes (main photo). They have a rubber outsole and cushioned soft insole, so you can literally walk into a swimming pool with them or stroll along the shoreline. Their ventilation and drainage system facilitates rapid dry-off time in preparation for evening wear as a casual loafer. That's one pair of shoes for the weekend. Gift!